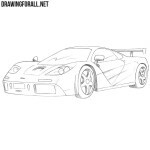 We know that you like cool sports cars, and so we constantly create new drawing lessons about different cars. 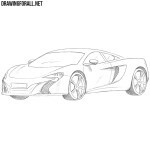 And so we decided to create a lesson about how to draw a McLaren MP4-12C. We always start our drawing lessons drawing the main outlines of the car’s body, and the lesson about how to draw a McLaren MP4-12C is no exception. So using very light pencil lines, sketch out the outline of the body as shown in our example. Now let’s outline the main parts of the car. In the front part sketch out the outlines and bumper and headlights. In the lateral part of our McLaren sketch out the outlines of wheel arches, wheels and rear-view mirrors. We continue to add the basic details and continue to use light lines. 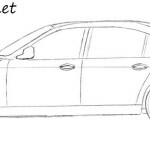 In front of the car draw the outline the bumper, in the upper part sketch out the outlines of the windows, on the body draw the outlines of the air intakes. Draw the outlines of the rims on the wheels and move to the next step. Starting with this step, we will use clear and dark lines. Here, with the help of smooth and dark lines, carefully draw out the hood and headlights of our McLaren MP4-12C. Next draw out the lines of the bumper and license plate as shown in our example. Do not forget to erase unnecessary lines from the front. Now we move to the top of our car. By smooth and dark lines draw out the outlines of the roof, front and side windows. Next draw out the rear-view mirrors and go to step number six. Continuing the smooth line of the roof neatly draw out the back of the car. Further, continuing the line of the side window draw out the door. 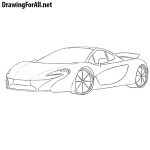 Draw the outline of large air intakes on the side of the body of our McLaren. 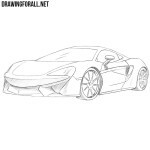 Perhaps the most difficult step of the drawing lesson on how to draw a McLaren MP4-12C. The whole difficulty of the lesson is that we will need to draw out the wheels and rims, which should turn out to be very round and smooth. Recall that it is not necessary to repeat the form of rims as in our example, you can come up with and draw any other form. Our McLaren drawing is almost ready. But the drawing will not look voluminous and realistic until we add shadows. So let’s add shadows using dense hatching and a bit of glare using long and light strokes. As you can see, it was a very difficult drawing lesson, but in the end we got a realistic drawing of McLaren. 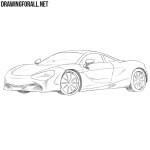 If you like McLaren and similar sports cars, then visit our category under the name “Cars”, where you will find a lot of very cool and interesting drawing lessons. Also do not forget that due to the fact that all cars (especially sports cars) are drawn about the same way, you can draw any sports car using the knowledge from this lesson.